Chamonix had long been associated in my mind as a ski resort, so I was intrigued when the chance to visit in the summer and see what it had to offer came around. I flew from Gatwick with EasyJet on the short flight to Geneva and then joined the one and a half hour Inghams transfer coach to Chamonix. The accommodation I was to stay in for the three nights was an Inghams chalet hotel - La Sapiniere. Staying in a chalet hotel is quite a social thing as you all eat together at the same time and can state a preference as to what table size you would like to have. The chalet is run and staffed by Inghams. The other guests were couples, families, groups of hikers and a lady in her 90's travelling alone, so a good mix of interesting people. The accommodation includes breakfast, packed lunch, afternoon tea, pre-dinner canapés and drinks, and dinner (including wine); I found this a very good value for money way of staying in Chamonix. The views from the bedroom balcony and the restaurant were incredible, as they overlooked Mont Blanc with its shimmering snow cap. The trip was billed as an active adventure and it certainly was! Early the next morning, we were off on the Aiguille du Midi Cable Car which starts right in the centre of Chamonix. Rising effortlessly high into the mountains (changing once en-route) to reach an altitude of 3,842m, we were given spectacular views over Mont Blanc and the French, Swiss and Italian Alps. We had left in blazing heat and now it was time to put your jumper and coat on as we were walking on snow and ice. I could feel the altitude difference as just walking a few steps up made you breathe faster. On the way back down, we stopped at the half-way point, where you change cable car, and took a small hike to the Blue Lake for our packed lunch. The sun was beating down, so off came the jumper and coats again. I loved this small hike to the lake, over uneven paths, as it gave a sense of adventure and we were overshadowed by the mountains. After lunch, we got back on the cable car to the centre of Chamonix; it was time to join our guided mountain bike ride. I had never ridden a mountain bike before but soon adapted to the big tyres and wide straight handlebars. The instructor gave an introductory lesson on how to use the gears, all 27 of them... We were in full 29-degree heat for this tuition and, with the hat on, it was sweltering. It was a bit too much to be honest and after 15-20 minutes of gear talk and wiping sweat from my face, my interest was disappearing. After that, I enjoyed the ride through the woods around Chamonix but was still clueless about the gears! Definitely do it again though. Back for dinner and to get changed. The chalet is well-positioned for an easy walk into town after dinner, before heading back for a welcome rest. The next day, we were up early and off again, taking the Montenvers Railway and the gondola down to the Ice Grotto. After many, many steps down, we were able to access inside the Glacier "La Mer de Glacé" (back on with the coat). Inside, we were shown ice carvings and told a bit about the ever-moving Glacier, which was so crystal clear you could see things which were frozen inside. Climbing back up to the gondola from the Glacier was hard work, as it was harder to breathe with the altitude. Once back at the top, we were off hiking again in the most stunning scenery. 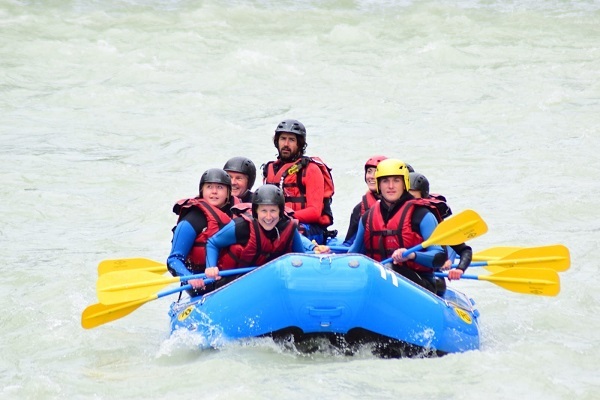 After lunch, we headed back on the train to join the next piece of excitement – white water rafting. We were kitted out in full wetsuit with boots and hard hat. The route was going to be a relatively easy route of a grade two. The water, however, was pure glacial with a temperature of four degrees. The raft held eight and we were positioned in size/weight ratio around it. Everyone had an oar and leaders were appointed so that we could follow their oar movements when needed. It really went at speed and the guide shouted instructions when we need to take action, including "Bansai" which basically meant you had to drop into the centre of the raft with your oar upright as there was a possibility we may turn over. Even though this was the first time I had done this and I was the oldest in the group, I must admit I was pretty good at it. I listened to instructions and acted on them at all times, mirroring the leader when using the oar. The route was six miles long and all over too quickly. I loved every second, even though my feet were icy cold from the water in the bottom of the raft. This was the highlight of the trip for me. High on adrenaline, we walked back to get dry, changed and ready for dinner. Next morning, we enjoyed a full guided walking tour of Chamonix to understand the layout a bit better and then back to the airport for the short flight home. A lot of adventure in a few short days made this feel like a much longer trip. I would thoroughly recommend a stay in the Chalet La Sapiniere. The staff were so friendly and it felt like heading home at night. 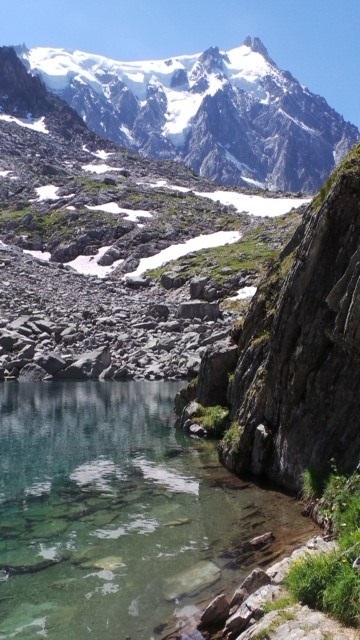 Chamonix has a lot of activities to offer in the summer and is certainly not just a ski resort. 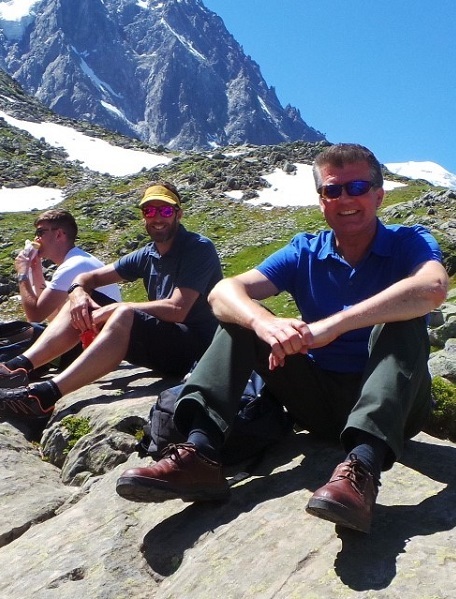 If you would like to book an active holiday like the trip that Mark enjoyed, or you want to venture into the Alps on a winter ski holiday, our team will be happy to offer some advice and recommendations. Call in at your local Fred. Olsen Travel Agents today; we have branches in East Anglia and along the south coast, including travel stores in Ipswich, Bournemouth and Colchester.